The BT-105 can connect up to two foot switches for forwards and backwards page turning and supports a number of different pedals. 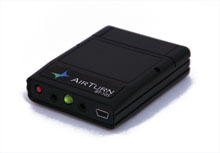 Shown below is the BT-105 with two ATFS-1 foot switches, which are specially designed by AirTurn to be completely silent, and as you can see, they have a very low, comfortable profile. We are waiting for our own set to arrive for live performance testing. The ATFS-1 switches were not available when we did our original development with NextPage, so we used the Boss FS-5 guitar-style foot switches. We found they worked extremely well, especially when standing to play. When sitting, you may find the the FS-5 a bit high for comfort when playing for long periods, but they are extremely well-made and will take a lot of hard use. They are not completely silent, but we’ve found that after a month of using them in live group performance, the sound isn’t noticeable. For solo work, we suspect the the ATFS-1 will end up being a better choice, and we’ll update this page with the results as soon as we’ve put them through the paces. But regardless of which foot switch you select, the BT-105 is going to free up your hands in the way musicians have previously only dreamed about. 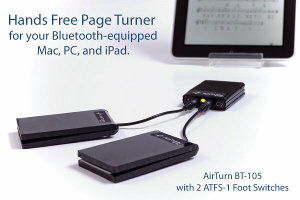 Together, NextPage and the BT-105 are going to free up your hands and allow you to perform better. And that’s what we care about at OnStage Technologies – helping you perform better. Making hands-free page turning practical for both professional and amateur musicians is what has driven us night and day for over a year. Add the BT-105 to NextPage. You will be delighted at getting your hands back!